How Results REALLY Happen — In Order..
Roman describes the order of progress in any fitness program. I’m currently taking on a few new coaching clients, so I figured I should preemptively answer some questions for them, addressing some of the more common concerns that tend to pop. Of course, these concerns tend to come up for just about everyone who is on any kind of fitness program, so I wanted to put this out there for you to think about. If you’re already using a program, or just starting one, awesome; this definitely will apply to you. If you haven’t started one, keep this in mind, because you’re gonna run into some of this stuff soon. Ideally, they occur–on my programs, this tends to happen very quickly; but, sometimes it doesn’t initially occur in the way clients expect or desire it. People think they’re not getting results, or at last not the results they want. Consequently, I get a lot of emails after the first few weeks of someone’s program, with questions asking why the results “aren’t” coming…but phrased in a way that show they are. Look, friends. Results can happen quickly, sometimes very quickly–but getting the complete package doesn’t happen overnight. And even if it did, you might not see it. First, let’s talk about the last point, about the mirror. You need to acknowledge and accept that in addition to being your own worst critic, you are likely not going to “see” things clearly. Because you see your body every day, the gradual changes are going to get noticed by other people first. I had one client about a year ago, Debbie; cool chick, a lawyer at a firm in Chicago. She told me that because she only saw her immediate supervisor at their bi-monthly meetings, he told her that he saw huge changes every time they saw each other. Obviously. To you, they’re tiny and infinitesimal and happen click by click. But, for someone who hasn’t seen you in two weeks, 3-5 pounds of weight loss, more muscle density, better posture, improved skin, and more energy are EXTREMELY noticeable. Make sense? Good. 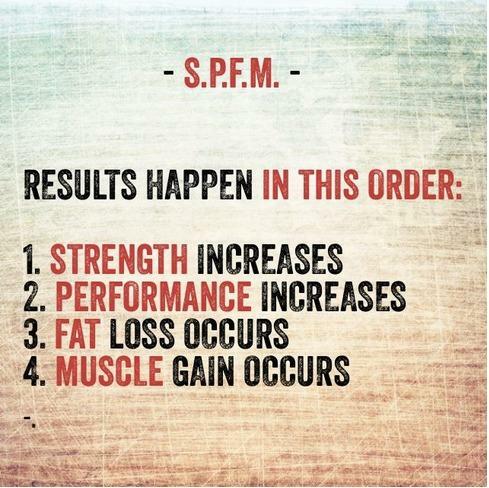 Or, if you like abbreviations, it’s SPFM. That is the process of progress — it’s in that order. Every. Time. Even if some of these things happen concurrently, SPFM will be the order in which they happen preferentially. Advanced trainees or pure mesomorphs will be a bit different. But, for most of us, it’s S.P.F.M., yo. It’s really that simple. And easy to remember. However, to make it easier, I made this picture on an app I’ve been playing with. Be patient, and keep working. You’re awesome. Isn’t that pretty!? OMG i luv APPz! Enough kiddingz. I do, though. And, that happens to be very accurate. Here’s why all of this happens. Strength is the first thing to increase for a few reasons, most of these having nothing to do with increasing actual strength, but rather your ability to access your strength. It’s often said that strength is a skill; this means that when you’re training with weights, you’re not just increasing strength, you’re also increasing your skill at lifting them. The more practice you get, the faster you’ll increase your skill. This is known as motor learning: you’re training your motor units to perform the task. Furthermore, you’re increasing neurological efficiency, or the ability of your nervous system to activate those motor units and allow them to perform the task. After strength, we have performance. By this, I’m referring to qualities like your strength endurance, aerobic and anaerobic capacities, and some intangibles like coordination. This is easier to understand: the more exposure you have to stress, the more adapted your body becomes to that stress. Training with weights, or at a high level of intensity with any other medium, forces you to adapt to fatigue. Simply stated, you’ll get better at training. This leads to increased fat loss. While you are probably going to lose a bit of fat pretty early on in the program, people tend to start making real strides about 2-3 weeks into a program. Once you’re adapted to it, you’re going to be able to perform it more intensely. Coupled with the heavier weights you’ll be lifting, the caloric expenditure is going to be much greater on day 25 than it was on day 1. Finally, we have muscle gain. Hypertrophy is a much slower process than fat loss. It takes both specified training, higher local volume, and a dedicated nutritional program. I could write for ages on this, and I have (and will do more s0), but because it’s a more exacting process, it comes later down the road. Oh! Something else to consider: even if you’re training for a different goal, you’re still going to see things happen in this sequence. No matter what. Of course, there will be some changes…for example, if you’re eating for muscle gain, you might not experience much fat loss, but you’ll hit strength and performance before the muscle starts to come. DON’T be upset that you’re “only” getting stronger but haven’t lost as much weight as you like. DON’T be upset that you’ve gotten stronger, leaner, and more athletic but haven’t added as much muscle size as you’d like. And most of all, DON’T be upset that everyone else is telling you how awesome you look and you don’t see it. All of these things will happen. They’ll happen pretty soon, and you’ll get the exact, specific goal you want. BUT–they’ll happen in order. SPFM. Because abbreviations are awesome (or, BAAA). So, congrats on any and all progress you’ve made so far; congrats on the progress you’ll be making in the weeks to come, and congrats on looking so damn awesome today–that shirt really brings your eyes, by the way. If you want to get results like “only” losing 5 pounds in the first two weeks alone, or “only” adding 20-30 pounds to your lifts, or “only” looking, feeling and performing better than you ever have, apply for my coaching program. I’ll be starting new clients at the both at the end of this month, and the beginning of the year. Meaning that if you’re accepted, we can start you in early December. Or, if you’d prefer, we can get you signed up now and you can start Jan 1, gettin’ dat resolution started. And, if you want to be an awesome friend/husband/wife/life-partner/child/parent…you can ALSO give the gift of sexification and grab a coaching package for someone else. All you need to do is specify that in your application–lots of cool stuff to come! I manage to find time to workout regularly by delegating some of my work to my virtual assistant (habiliss) but it was disappointing to find that i haven't made any progress in trying to gain lean muscle. Well since reading your post , i have decided to keep at it a while longer...thanks for the insightful post! Whatever kind of sports you are doing, it is crucial to provide your body with nutritional support. Especially after hard trainings. I've read thousands times that we don't get enough nutrients from our everyday meals. That is why, supplementation is necessary. You just have to find a high quality product. I've searched through internet, studied articles and reviews, and finally found the product for myself - Military Grade supplements. My basic criteria was natural compounds. Then, I liked the reviews, which were mostly positive, highlighting the visible effect of the product. So, I've tried them myself. Started with 1 bottle of their new post-workout product - Second Wind - and was surprised greatly! Almost no fatigue after my workouts, no muscle soreness and lots of energy throughout a day! This product is definitely worth trying. This is something that I should share with my clients. As a trainer, we understand results take time, but painting the picture like this will give me a better way to explain their progression and set real expectations. Thanks for the help and insight!!! This is a great read, particularly for intermediate and advanced lifters for whom teh gainz don't seem to come as noticeably or quickly. Thanks, Roman. Moral of the story...don't give up. I'm sure over the next six weeks or so those baggy shirts should be filling out after pie, turkey, and stuffing. Great post, my friend. Inspiring and will help people push through the period where things are working but they're not visibly seeing the results they want. Nice image - what app did you use to make that? Guessing Over or Phonto but curious. Looks awesome.